Gregory's Cave is located in the Cades Cove area of The Great Smoky Mountains National Park which is Blount County Tennessee. Gregory's Cave is short with only about 600 feet of passage ways. the cave does have a number of formations and was once a commercialized cave. The cave is gated and permission from the park service is required to enter the cave. Trespassers will be prosecuted. 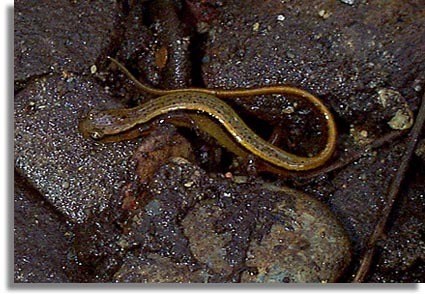 Latitude - N 35° 36'38"
Longitude - W 83° 48'20"
During USGS surveys of Gregory's cave conducted by a team lead by Kenneth Dodd three species of salamanders were observed. The Long-tailed Salamander (Eurycea longicauda), the Northern Slimy Salamander (Plethodon glutinosus), and the Blue Ridge Two-lined Salamander (Eurycea wilderae). Five species of frogs were observed: the American Toad (Bufo americanus), Fowler's Toad (B. fowleri), Wood Frog (Rana sylvatica), Pickerel Frog (R. palustris), and Northern Green Frog (R. clamitans).